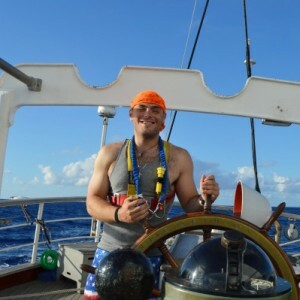 This spring, Environmental Science major Alexander Pica ’18 is participating in Stonehill’s SEA Semester program and sailing 2,600 nautical miles from Pape’ete, Tahiti, to Honolulu, Hawaii, to study the effects of environmental change on remote Pacific reefs. SEA Semester’s Pacific Reef Expedition coincides with what is predicted to be one of the strongest El Niños on record, thus providing a rare opportunity for students to chronicle how these reefs respond to dramatic climate fluctuations, and to contribute to a growing body of knowledge on the subject. On April 25, after a rigorous application process, a class of 17 undergraduates majoring in a wide variety of academic disciplines began participating in new online coursework to prepare for the expedition. They joined SEA’s state-of-the-art ocean research vessel, the SSV Robert C. Seamans, a 134-foot brigantine, in Tahiti on May 23 for a four-week research voyage stopping in three distinct island atolls, Caroline Islands, Rangiroa, and Christmas Island, to conduct oceanographic field research. The phenomenon of El Niño brings rising water temperatures and the potential for widespread changes to the marine environment, impacting both the ecosystem and the people who inhabit these regions. Students will conduct snorkel-based surveys of local corals, fish, and invertebrates to help shed new light on the ability of these reefs, which support some of the richest diversity of species on the planet, to endure and adapt to global climate change. SEA’s Pacific Reef Expedition allows students to deepen their awareness of and appreciation for the ocean through hands-on research and personal experience. In addition to their research, students will retrace the historic voyages of Polynesian migration, and master time-tested navigation methods that rely on the sun, stars, and moon, as well as other practical skills in seamanship. On board, all students will become full working members of the ship’s crew, sharing responsibilities for standing watch, processing oceanographic samples, learning to navigate by the stars, and participating in round-the-clock operations. Perhaps most importantly, students will learn to challenge themselves and will cultivate new skills in leadership, teamwork, and field research.